DO YOU GIVE YOUR HOSES A REGULAR CHECK UP? 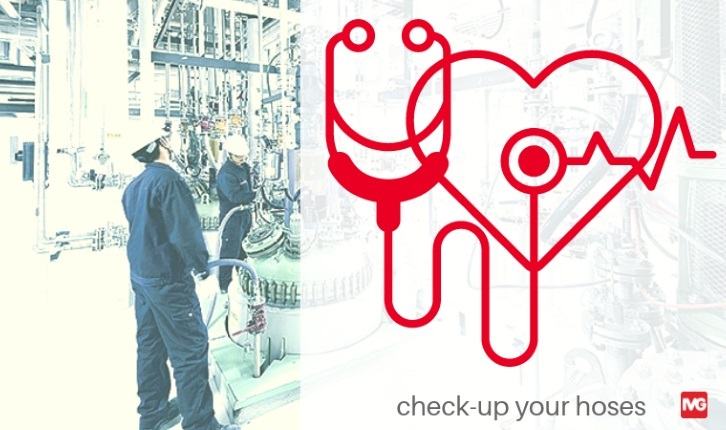 IVG Colbachini > Projects > DO YOU GIVE YOUR HOSES A REGULAR CHECK UP? In chemical companies the danger of exposure to toxic and harmful substances and preparations is daily: an enormous quantity and variety of products, more or less poisonous, involve an extreme spread of chemical risk. Rubber hoses, or other materials, are a critical part of your system. Because they support the moving parts of the plant. Because they work intermittently and are connected and disconnected frequently. Because they are subject to vibrations and mechanical stress. Because they convey different fluids at different times, with variable temperatures and concentrations. Have you ever wondered what you need to do to find out if your hoses are healthy? Here are 5 easy steps to make a regular check up and decrease the incidence of unforeseen breakages. 1 - Give yourself a time. Set a period for the inspection - no more than 6 months - for hoses and fittings. Do not forget to examine them before each new use or after a long period of storage. During the periodic checks, pay attention to the status of the hoses and fittings to detect the appearance of anomalies, which indicate a degradation status of the hose. 3 - Become an expert. Detect any irregularities on the hose cover (cracks, cuts, abrasions, swelling) and on the structure (deformations, discolouring of the layers, exposure of reinforcements). Touch the hose to feel if there are soft or sticky areas. 4 - Shift your attention. Examine the fittings. See if there are any oxidations, signs of corrosion, cracks or leaks. Manually check if the connection to the hose is firm. If your hoses perform under severe conditions, if they are dragged over abrasive or sharp surfaces, forced into extreme bends, or working exposed to weathering agents, you are going to need to periodically perform a pressure test and an electrostatic dissipation test in accordance with the latest standards. If a hose has one of the anomalies listed, do not wait to take it out of service. The leakage of a dangerous fluid increases the risks related to human health and the integrity of the environment. If you have any doubts, contact us: we can check-up on your hoses together.